LEMFO LEM4 Pro is a very controversial device, some of its functions are unique, and some functions are simply strange. Let’s look at this in any case, a specific Smartwatch Phone and think about whether it is worth giving $129 for it. * Mastery, Using AL6063 aluminum alloy anode oxidation frame, CNC processing light through multi-layer surface grinding, anti-corrosion corrosion, anti-scratch. * 2.2 inches large screen, 320X240 HD resolution, highlight the full look of the LCD, the effect is exquisite and bright, and excellent. show the effect of a gentle force of direct, excellent quality. * Video call, Regardless of work or life, you can easily reach with your friends and family video calls. * Gps, Built-in high-performance gps-module, precise positioning for each location. * Pedometer, LEM4 Pro smart watch will take into account your steps, pedestrian distance and calories burned. You can also set the day or week of the goal. Let you have a good healthy habit. * Operating system Android 5.1, You can download all kinds of Android applications. For example, a music application, a game application, a video game application, faceboock, twitter, whatsapp, and so on. * Check the weather – There is a weather app in the clock. You can check the weather daily in hours. You can also use “Google voice” to find weather information. * Music – The lem4 Pro has 16 GB of internal memory, so you can take music with you. put on a Bluetooth headset and listen to your songs without the weight of your phone. * Google Now – You can also download and install other voice assistants from the Google play store. 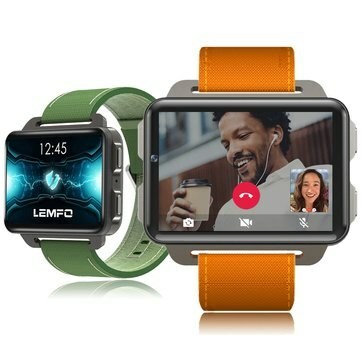 * Built-in 0.3MP camera – LEM4 Pro smart watch can be used for photographing or recording video.